The filtration/drying membrane units utilised in the Hi-line Industries HI-DRI dryers help eliminate condensation, oxidation and microbial growth. Hi-DRI membrane dryers are reported to deliver superior levels of reliability, performance and energy efficiency and are finding applications in the medical, dental, paint/bodyshop, analytical equipment, robotics and laser printing industries, among others. Hi-DRI compressed air membrane dryers include a patented arrangement of structurally packed, permeable hollow fibres that are spirally wound on a support core. This combines efficient air flow with high contact areas to maximise drying performance. The Hi-DRI systems have a compact, ‘in-line’ design. This ensures the products are suitable for in-line installations that guarantee the delivery of dehydrated compressed air to the point of use. No electricity or energy supply is required, making these lightweight units ideal for remote, isolated or other challenging requirements. Offering cost effective and efficient filtration and drying in a single unit, Hi-DRI units offer numerous benefits to end users, Hi-line Industries reports. For instance, the membrane construction of the units does not deplete oxygen from compressor, which means it can be used as ‘breathing air’ dryer. Furthermore, there is no condensed H2O to deal with as this is removed as a gas. The membrane dryers contain no refrigerants. Hi-DRI membrane dryers do not contain any moving parts, and there are no desiccants or refrigerant to replace. As a consequence, users enjoy a long, maintenance-free service life with low TCO (total cost of ownership). 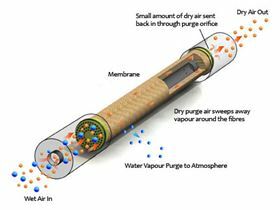 This simple, proven technology helps eliminate condensation, oxidation and microbial growth, all of which are known to result in the poor reliability and performance of downstream air operated equipment. Almost any dewpoint can be achieved (flexible pressure dewpoint down to -40°C), even when accommodating high humidity ambient conditions as experienced outdoors, in open workshops or on seagoing vessels. Hi-line can also provide pre-filtration, which further enhances the membrane dryer’s efficiency and compressed air quality downstream and at point of use. Offering low purge air in comparison with desiccant dryers, the range of Hi-DRI membrane air dryers covers air flow rates of 17-1050 litres/min. Multiple dryer units can be used in parallel to achieve higher flows where required. Outlet dewpoints from +15° to -40°C can be achieved at 7 barg pressure (12.5 barg max) and with 35°C inlet air temperatures. The UK’s Hi-line Industries Ltd relocates to a new, larger production plant in Burton-upon-Trent, Staffordshire. The 2018 Tundra range is the most energy efficient to date, helping to drive down energy costs by minimising pressure drop and lowering absorbed power.